Oceans of music are flowing in under, over, and around me. 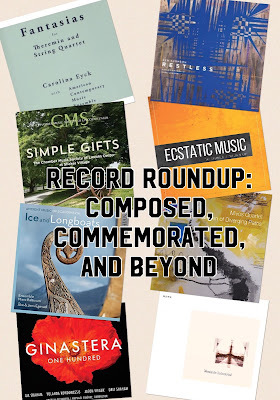 This is no last-gasp geyser, but rather the result of passionate musicians, composers, and labels pursuing musical bliss - and delivering it to us lucky listeners. 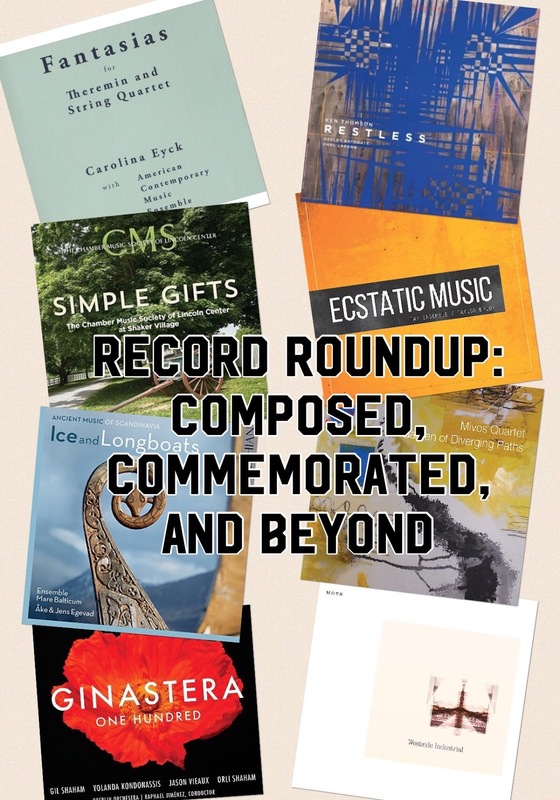 In another attempt to stem the tide, here is a roundup of recent or upcoming releases in the realm of classical, contemporary and avant garde music. Fantasias for Theremin and String Quartet - Carolina Eyck with American Contemporary Music Ensemble There are so many ideas and even theories behind this music - from how it was composed to fit an LP record, to the way the names of the pieces were chosen ("...by scanning multiple Scandinavian languages for pleasing lingual combinations...) - that I am reluctant to add more words about it to the world. Beyond "You must hear this!" that is, as it is an extraordinary album. I was aware of Eyck as a theremin virtuoso, but not as a composer. In this case, she wrote the string quartet music, sometimes sparkling, sometimes melancholy, always melodic, played here by Caroline Shaw, Ben Russell (violins), Caleb Burhans (viola), and Clarice Jensen (cello), and then improvised her theremin parts while listening to the recordings. You would never know that, however, so well does it all fit together, taking you on a seamless journey as only a well-sequenced album can. While some of the sounds she causes the theremin to emit did have my wife saying "Getting spooky!" there are almost no clichés to her use of this early electronic instrument. It often sounds like the human voice and, in fact, and I've never experienced the bass tones of the theremin as she plays them here. I strongly recommend you find a real stereo with which to listen to Fantasias. Kudos to producer Allen Farmelo for the technical wizardry and for the literate and fascinating liner notes, including thoughts on dragons and Derrida. This is one of the records of the year - and you can hear it live for the first time on November 4th. Ice & Longboats - Ensemble Mare Balticum For more journeys in a Scandinavian vein, set sail with these meticulously researched (yet still speculative) performances of ancient music (1200-1582) from that region, on recreated instruments. It's highly atmospheric, sometimes hypnotic, and only the merest bit kitschy. Anyone making a movie or TV show about Vikings - here's your soundtrack. Taylor Brook: Ecstatic Music - Tak Ensemble Based on Ice & Longboats, Vikings liked strange and dissonant sounds on occasion, which makes me think they would have liked some of this album. Brook likes to push the envelope, employing extended and techniques to produce music which never becomes quite familiar even upon repeated listens. The title track has a ritualistic, theatrical sound that is highly evocative, violin and percussion combining to sound like much more. The use of "microtonally tuned guitars" as drums probably helps in that regard. The sense of theater continues with Five Weather Reports, a song cycle with words from David Ohle's cult novel Motorman. Charlotte Mundy does a remarkable job with the vocals, switching from spoken word to soprano flights on a dime, all perfectly pitched, with command and humor. Mundy is also great with the vocalise of Amalgam, the last piece, but then all of the Tak Ensemble members show complete commitment to Brook's conception, turning in sympathetic performances (including using his guitar machine) that are further proof that it's a wonderful time to be writing challenging, original music. Let your ears be sympathetic as well, especially the first time you listen - the rewards of Ecstatic Music are many. Garden of Diverging Paths - Mivos Quartet Taylor Brook's music also features on this album by Mivos, an adventurous group whom I discovered because of their gorgeous collaboration with vocalist Zola Jesus. Here they play three works based on the written word, starting with Brook's title piece, which is based on a short story by Borges and uses imaginary theories and histories to create music that sounds alien and ancient at once. Andrew Greenwald, who co-directs Ensemble Pamplemousse, contributes A Thing Is A Hole In A Thing It Is Not, a single movement of scratchy, scrapey and high-pitched sounds that somehow holds together. The title is from a remark by conceptual artist Carl Andre and keeps you guessing as much as the music does. Greenwald has also produced arrangements of this work for two cellos and even solo euphonium - check it out. The final work, Nadja, finds the Mivos joining forces with the composer, Kate Soper, who sings vocal parts drawn from Tennyson, Ovid, and Breton. Even in the quiet moments, this is fiercely engaging listening, and Soper is in fine form. This whole collection more than lives up to the "adventurous" tag I hung on the Mivos above. Now it's your turn to be adventurous and listen. Ginastera: One Hundred - Yolanda Kondonassis, Oberlin Orchestra, et al If you're crying for more Argentina in your life after listening to the Borges-inspired piece on the Mivos album, have I got a record for you. As the title makes plain, Alberto Ginastera was born 100 years ago, which means he began composing at a critical time in the development of a distinctive Argentinian culture. The central tension between the rural (old) and urban (new) was an animating force in much of the music and art of the time and Ginastera rode the line in fine style. His Harp Concerto, performed here with extraordinary skill and feeling by Yolanda Kondonassis, is the definitive large-scale work for her instrument. Ginastera surrounds the harp's sparkle with colorful, wonderfully evocative melodies, harmonies and orchestration. One thing that makes the Concerto special is the way he both pushes the harp into new territory and exploits its familiar qualities perfectly. Kondonassis couldn't have asked for a better partner than the Oberlin Orchestra under the direction of Raphae Jiménez. Actually she did ask for it as she executive-produced the album. She must have a hell of a Rolodex, too, as the other works are performed by the likes of Gil Shaham, Orli Shaham, and Jason Vieaux, who are all the best at what they do. The Sonata for Guitar is a late work for Ginastera, composed in1976, seven years before he died. It seems to synthesize many of his ideas about the past informing the present and Vieaux's playing is preternaturally assured, dashing off the intricate work with the flair of a gaucho troubadour on horseback. The Shaham siblings acquit themselves nicely in the romantic and slightly jazzy Pampanea No. 1 and Orli digs into the cutting-edge virtuoso charms (two keys at once? We got that!) of Three Danzas Argentinas to close the album. Kondonassis has done a service to Ginastera's legacy with One Hundred and we are the beneficiaries of her advocacy. I would say if you own one record of Ginastera it should be this one - however, I think you'll want more after hearing this. Simple Gifts - The Chamber Music Society of Lincoln Center As it happens, Ginastera studied with Aaron Copland on a Guggenheim fellowship in the 40's, learning much about how to push harmonies further while still keeping your music accessible. Appalachian Spring, Copland's score for a Martha Graham ballet, is Exhibit A for this approach, feeling as American as corn on the cob without being corny, thanks to its spare, modern design. This is much like the Shaker attitude towards design and architecture, which makes their furniture and buildings look so timeless and inviting. Of course, Copland's masterpiece has been recorded dozens of times, including a fairly definitive account conducted by the composer and recorded in glorious Living Stereo in the early 60's. But here we have what may be the best version yet. Marketers at Lincoln Center would like you to know that it was recorded live "in the heart of an authentic Shaker village," and filmed for broadcast on PBS. This is a first, apparently, and maybe it did inspire the musicians to new heights. The tempos are perfectly judged, the dew-limned opening notes flowing into one of the great slow builds in music, kept so taut that you're on the edge of your seat even if you've heard the work many times, and the full gallop is as thrilling as it should be. The sonics are delightful as well, with clear textures, a wide dynamic range, all the detail you could want - and no audience noise, not a cough or a creaking chair, intrudes. Until the end, that is, when the crowd explodes, seemingly fully aware that they had just heard something special. Due to my own particularities, the rest of the album, which includes short pieces by Louis Gottschalk, Samuel Barber, Dvorak, Mark O'Connor and Stephen Foster, is basically superfluous. Everything is performed brilliantly - the CMS is a band of virtuosos - and if you like the music you'll love this recording. I also loved reading the excellent liner notes and learning that Barber was a fan of Edie & Rack, the 1940's piano duo - I've never seen their names anywhere except on singles that I found in my grandmother's collection after she died. Perhaps she and the composer of Adagio for Strings crossed paths at the Blue Angel Club...but I digress. This is the Appalachian Spring to hear, so make a plan and get it done. That's the American way. Restless - Ken Thomson If Copland is bit on the modern side for you - but you like it - here's a quick catapult into the 21st century, and I promise a painless flight. Throughout this album, composer Thomson displays a muscular approach to romanticism that is shorn of sentimentality - this is emotional music, but free of bathos or ornamentation. Restless, a four-movement work for cello and piano, sounded perfect the first time I heard it, as if it had always been there, but also very fresh. Think of your favorite room, and imagine it as it was when it was new - that's Restless, with the fourth movement being the dark corner you don't visit often. Part of its indomitability must be due to the spectacular playing of Ashley Bathgate (cello) and Karl Larson (piano), who sound like much more than a duo. Bathgate is a Bang On A Can luminary, so I would expect no less, but Larson is new to me, and it is he who is in the spotlight on side two (like Eyck's Fantasias, this was conceived as a vinyl album). Me Vs., a three movement work for solo piano, can be spikier and more fragmented than Restless but still feels inevitable and deeply involving. Thomson has done something very special here, and while these recordings and performances are already ideal, I hope to see both of these pieces enter the repertoire on record and in the concert hall. Think I'm blowing smoke? Come to Le Poisson Rouge on November 9th for the album release concert and hear for yourself. Westside Industrial - M.O.T.H. Like most of the records discussed here, there is more than meets the ear to Westside Industrial. If you're interested, you can look into the conceptual framework in which the project is "a narrative response to the commodification of culture and the fallout that occurs when lifestyles are turned into brands in order to sell real estate." There is a performative aspect as well, using "handwritten journal entries, voicemail recordings, poetic dialogue and photographic imagery," framing a narrative. But here we just have the music, three long tracks of "nervous ambient" (my term), created using guitars, analog pedals, radio signals and other sound generators, making for seamless audio paintings. It's quite beautiful, and the details, especially when listening through headphones, are wonderfully textural. This is the second album by M.O.T.H., the nom de guerre of Matt Finch, with 3 Vignettes from 2015 being equally worthy of investigation. Between the two albums, M.O.T.H. should now be considered to a reliable brand name of it's own. Buy in. As always, let me know what I'm missing, and keep up with the totality of 2016 here.